Just three days after one trio left the International Space Station, another launched toward it. A Soyuz-FG rocket lofted the Soyuz MS-07 mission spacecraft into orbit where it and its crew will spend some two days catching up with the outpost. Liftoff took place at 1:21 p.m. local Kazakh time (2:21 a.m. EST / 07:21 GMT) Dec. 17, 2017, from Pad 1/5 at Baikonur Cosmodrome in Kazakhstan. 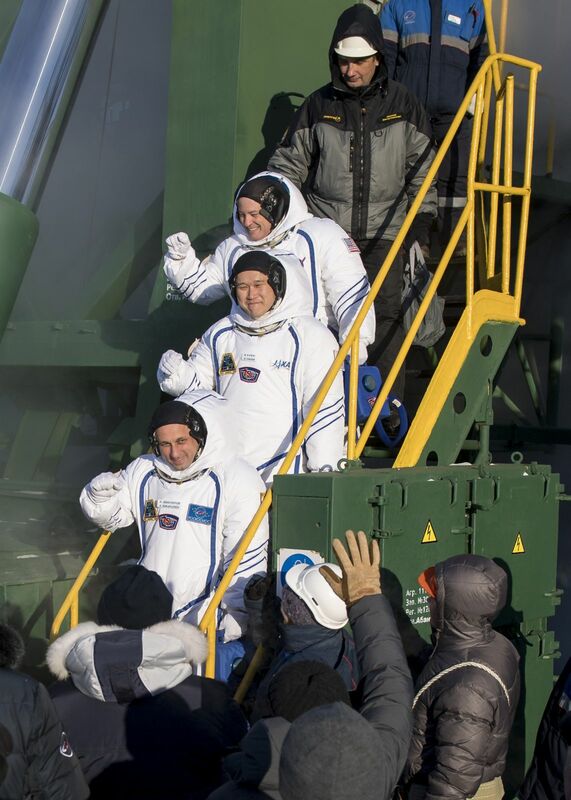 On board is veteran Russian cosmonaut Anton Shkaplerov – currently on his third flight – and rookie astronauts Scott Tingle of NASA and Norishige Kanai of the Japan Aerospace Exploration Agency. Soyuz MS-07 will utilize the longer, 34-orbit rendezvous profile to reach the space station. According to NASASpaceflight, the spacecraft was originally targeting Dec. 27, but NASA asked for the launch to be moved forward to avoid having personnel at Baikonur or in transit over the holidays. As such, the spacecraft was not able to employ the much faster six-hour, 4-orbit rendezvous profile. Additionally, SpaceX’s CRS-13 Dragon is currently inbound toward the space station. It is scheduled to arrive only a few hours after Soyuz launched, with installation set for 7:30 a.m. EST (12:30 GMT). Dragon was launched by a Falcon 9 on Dec. 15. Soyuz MS-07 was the 136th flight of a Soyuz spacecraft since its debut in 1967. 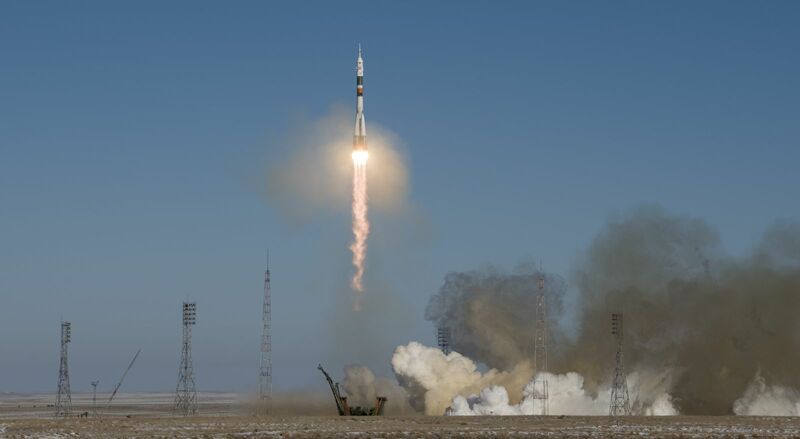 It launched atop the 162-foot (49.5-meter) tall Soyuz-FG rocket. The vehicle has two or three stages, depending on how you classify the four strap-on boosters. Each of the 64-foot (19.6-meter) long liquid-fueled boosters is powered by an RD-107A engine that produces some 188,500 pounds-force (838.5 kilonewtons) of thrust at sea level. They are attached to the 9.7-foot (2.95-meter) wide, 91-foot (27.8-meter) tall core stage that sports a single RD-108A engine, which at launch produces about 178,000 pounds-force (792 kilonewtons) of thrust. The upper stage is 22 feet (6.7 meters) long and 8.7 feet (2.7 meters) in diameter. Its RD-0110 engine produces 66,980 pounds-force (298 kilonewtons) of thrust in vacuum. Lifting off on time, the four boosters and core stage powered the stack spaceward. About 70 seconds into flight, the Soyuz passed Mach 1. Some 44 seconds later, the launch abort tower at the top of the vehicle was no longer needed and was jettisoned. Seconds after that, the four strap-on boosters consumed their fuel and fell away. The launch shroud that encapsulated the Soyuz MS-07 spacecraft and its crew also fell away at 2 minutes, 37 seconds into the flight. Four minutes, 45 seconds after leaving Kazakhstan, the core stage finished its job and shut down. Two seconds later, the upper stage engine ignited and the core stage separated. The upper stage continued propelling the Soyuz MS-07 and its crew into orbit for another five minutes before shutting down 8 minutes, 45 seconds after liftoff. The spacecraft separated three seconds later. Within seconds, communications antennas and the two solar panels deployed successfully and the spacecraft was confirmed in a good orbit. Over the next several days, the Soyuz MS-07 will gradually increase its orbit and catch up with the ISS. Rendezvous and docking with the Rassvet module is expected at about 3:43 a.m. EST (8:43 GMT) Dec. 19 to bring Expedition 54’s crew count to six. Shkaplerov, Tingle, and Kanai will join ISS commander and Russian cosmonaut Alexander Misurkin and NASA astronauts Mark Vande Hei and Joe Acaba, who have been aboard the station since September 2017. Misurkin, Vande Hei, and Acaba were launched in Soyuz MS-06 for a 5.5-month stay aboard the ISS. They are scheduled to leave at the end of February 2018. Shkaplerov, Tingle, and Kanai are scheduled to stay at the outpost for more than four months, according to NASA. During their stay, they will perform more than 250 science investigations in biology, Earth science, human research, physical sciences, and technology development, the space agency says. After the upcoming Dragon berthing and Soyuz docking, the next major activity for the ISS will involve seeing the Progress MS-06 cargo freighter undock from the Zvezda service module. That is anticipated for late-December, or early January 2018.